One of the least popular homeowner “honey-do” tasks -- right up there with toilet scrubbing or cat litter emptying -- is (yuck!) gutter cleaning. You could install gutter guards as a way to simplify this annoying chore, but are they really worth the cost? Let’s take a look at what gutter guards are, exactly, and what they can do for your home. First, What's A Gutter For? And Why Does It Need Cleaning? Without regular gutter cleaning, all these things can block your gutters and eventually prevent water from draining off through the downspout system as intended. Instead, it will end up soaking into your fascia boards, walls, and/or foundation, where it may do thousands of dollars’ worth of damage and even threaten the structural integrity of your home. In winter, water backup will freeze, resulting in ice dams which can tear off the gutter installation, downspout, fascia, etc., etc. Designed to minimize gutter cleaning, gutter guards are covers which keep out debris and allow rainwater and snowmelt to flow freely through your gutters. They can be included in the gutter installation or retrofitted at a later date. Screen gutter guards are the commonest and cheapest type, which are uncomplicated to install as a DIY project. Just cut PVC or aluminum screening to the dimensions you need and drop or slide it into place. However, standard screen gutter guards don’t filter out smallish items like pine needles. Foam gutter guards are extremely porous foam strips that are inserted in the gutter. Water passes readily through the foam, but solids are trapped on top. These are super simple for the home handyperson to put in place. Brush gutter guards work similarly to foam. Place them inside the gutter and they’ll allow water to pass through, yet trap any solid particles in their bristles. This is another excellent do-it-yourself choice. Micromesh gutter guards have tiny holes, capable of filtering out almost every size of debris. They should be installed by an experienced roofing pro, either mounted under your roof shingles or attached to your fascia and to your gutter. For durability, choose surgical stainless steel mesh. Surface tension gutter guards are curved covers that guide water into the rain gutters, while solids slide harmlessly off the guards and onto the ground. Once again, find a professional roofer to install these. 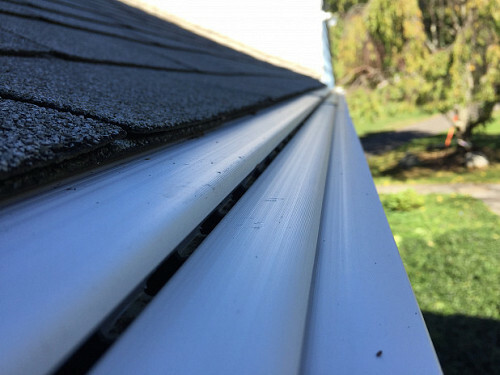 Do Gutter Guards Eliminate Gutter Cleaning Completely? The good news is that gutter guards can cut down significantly on gutter cleaning work … and the clogs that result when cleaning is neglected. The bad news is that they are unlikely to eliminate this job completely from your home maintenance checklist. You will have to budget a certain amount of time to remove rubbish from the gutter guards themselves. This is a lot less trouble than old-school gutter cleaning, though, and only needs to be done every couple of years ... as opposed to at least twice annually without gutter guards. The average cost to install 200 running feet of mid-range gutter guards is $1,500-2,000. (Cheap gutter guards tend to be poor quality, which may need frequent repair or replacement.) Do the math and decide whether you feel the added convenience is worth it to you personally.